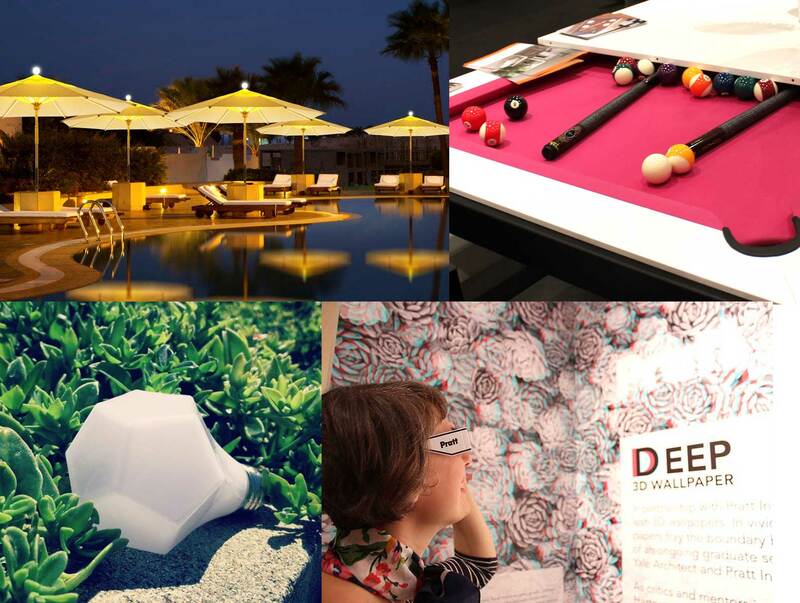 Where can you find phone-charging tables, transforming furniture and trippy 3D wallpaper all under the same roof? 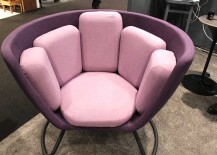 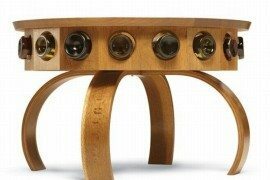 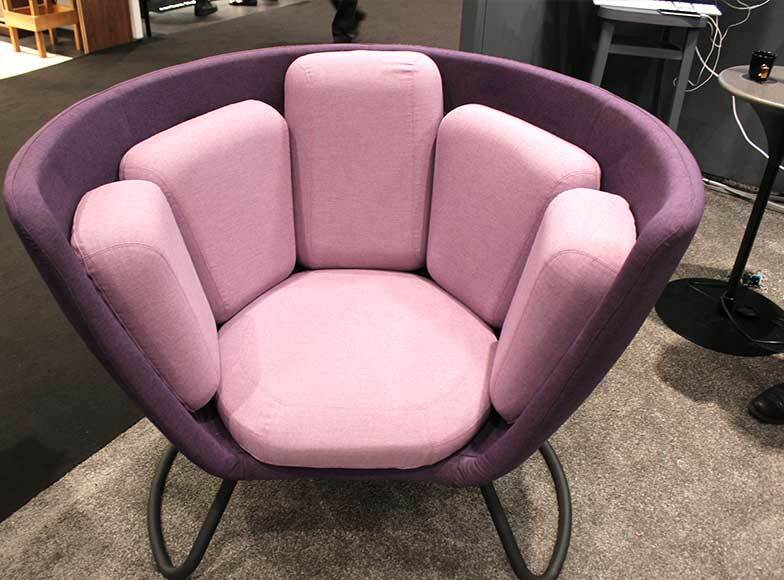 They may sound like things you’d see in the home of an eccentric millionaire, but they were actually all spotted at the 2015 International Contemporary Furniture Fair in New York City. 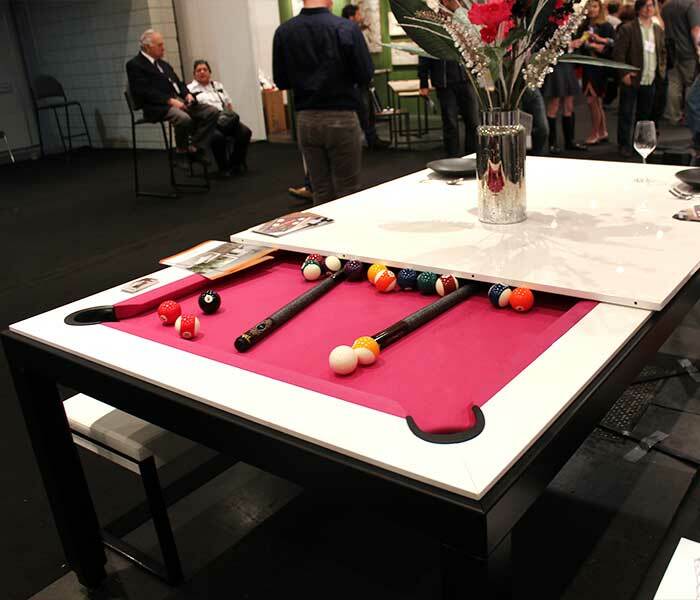 This year’s 165,000-square-foot show floor featured all the usual suspects from sleek sofas to high-end tables and luminous lighting, but there was a noticeable buzz around playful designs that put a smile on people’s faces. 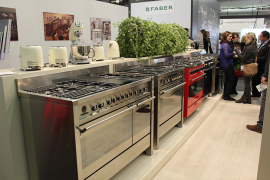 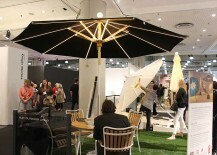 Come along as we check out some of our favorite fun and functional designs from this year’s show. 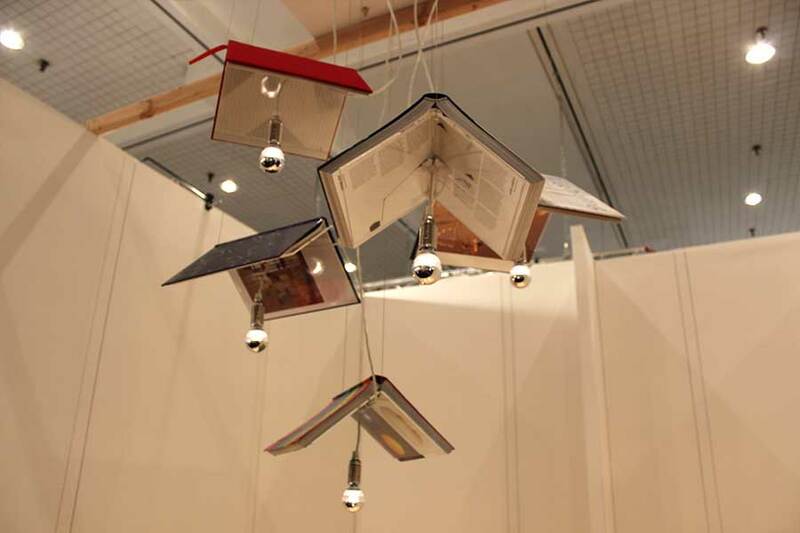 Iranian designer Ali Siavoshi‘s delightful book lamp gives new meaning to the term “reading light.” Each packet comes with an energy-efficient LED bulb and a clear acrylic panel that can be topped with any book of your choice. 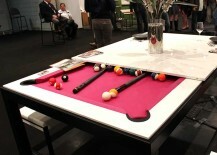 Talk about a great combo (shot)! 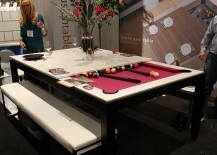 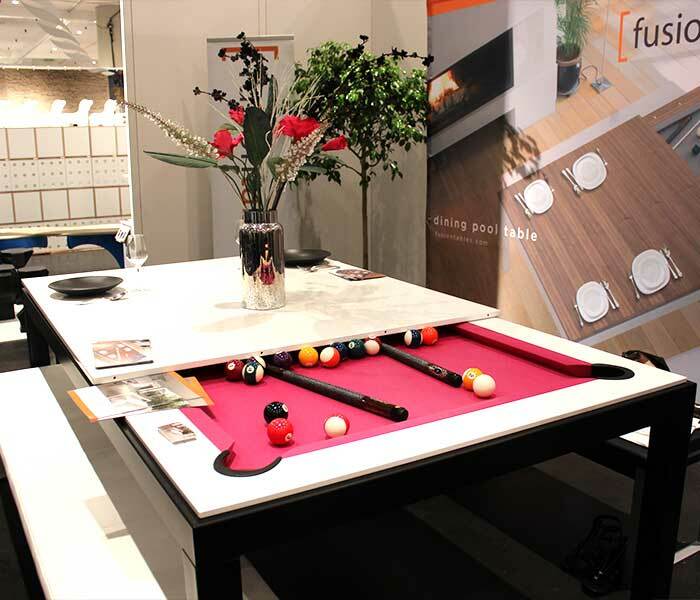 Fusion Tables‘ unique 2-in-1 billiard-and-dinner tables are perfect for homemakers who moonlight as pool sharks. 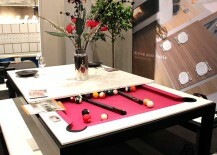 Just use it as a regular table and when you’re ready to play, the glossy eating surface comes off easily as three separate panels. 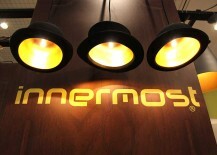 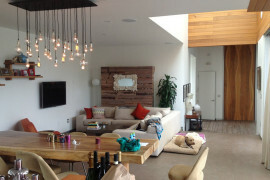 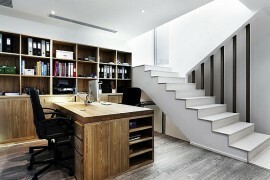 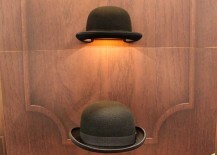 Aren’t these Innermost hat lamps such a *bright* idea? 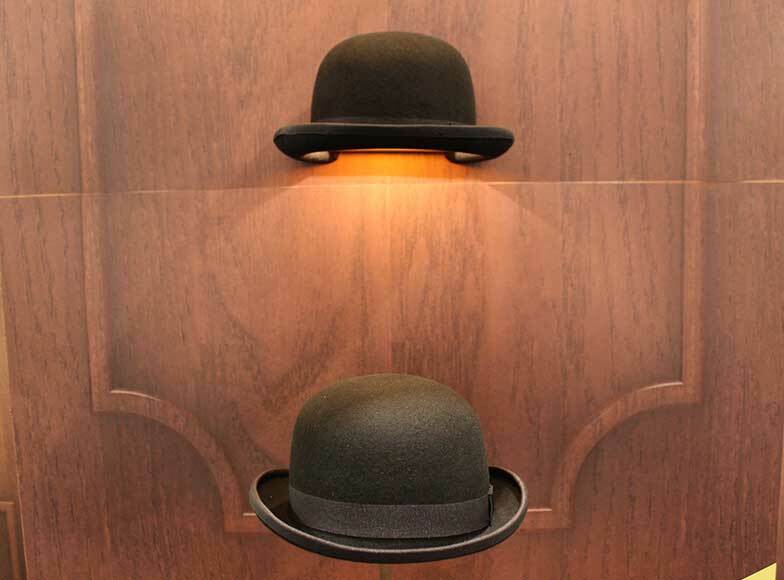 The company used to make them with repurposed bowlers, but had to learn how to manufacture the hats themselves the old-fashioned way when demand increased. 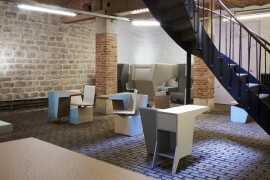 The ultimate piece of multi-purpose furniture for the urban dweller, Immersion Design’s Coalesce Loft packs an almost unbelievable amount of functionality into a Swiss Army knife-like design. 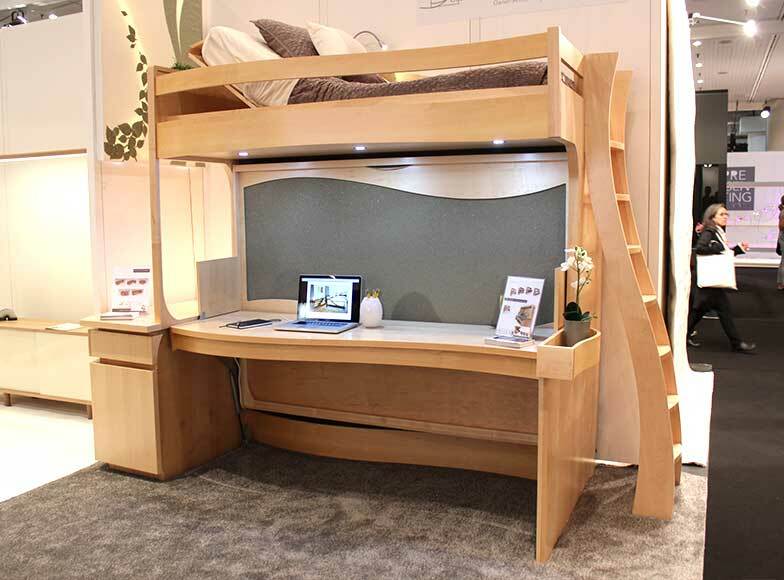 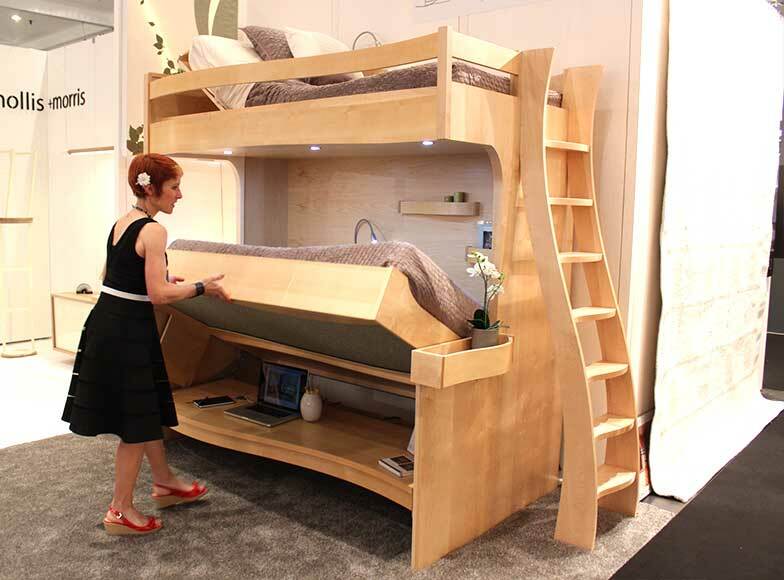 From its desk that flips out into a bed to an extendable side table to a lofted second bed that tilts for your comfort, the flexible piece is like a playfort mixed with a piece of furniture. 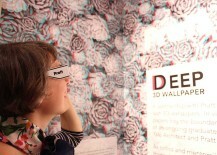 The Pratt Institute and Twenty2 Wallpaper teamed up to transport people back to the 70s with their psychedelic new 3D wallpaper collection. 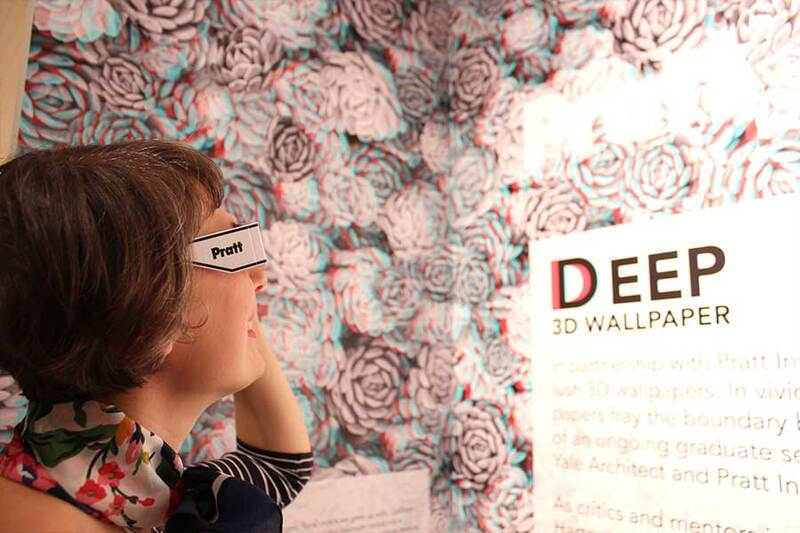 Visitors were invited to don 3D glasses to experience the collection of five disorienting patterns in both two and three dimensions. Phone out of juice? 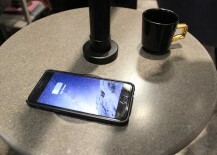 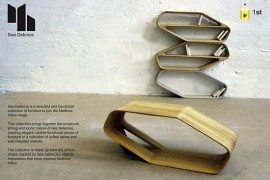 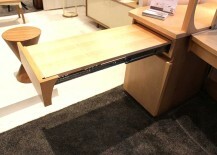 No need to plug it into a charger with Design on Technology‘s clever phone-charging furniture. 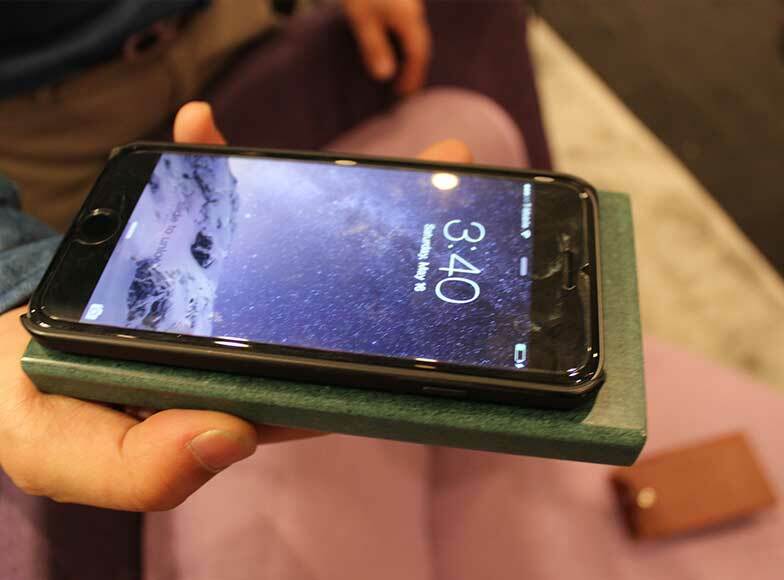 The Korean company embeds wireless charging modules into tables, shelves and even chairs, but the units can also be purchased as standalones for about USD$100. 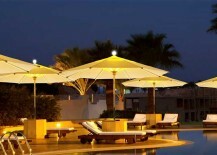 Add a touch of festivity to your al fresco dining with Slik Outdoor Living‘s festive LED-integrated NI parasol. 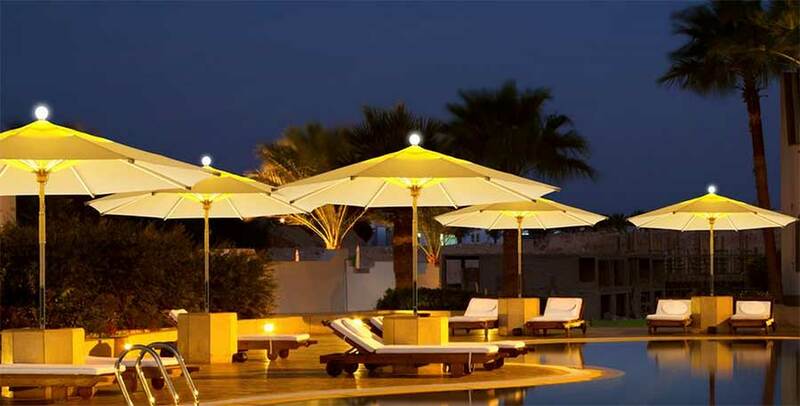 The eco-friendly sunbrella is named after the Spanish word for “either” because it can be used as either a shade-providing parasol, a beautiful ambient light or even as a way to signal for service when used in a restaurant setting by turning on the cute round bulb atop it. 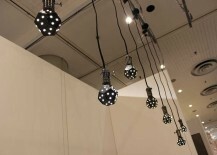 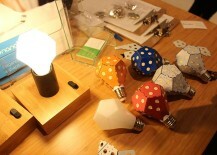 Like a diamond in the rough, Nanoleaf‘s Gem bulbs are revolutionizing the LED lighting market with their unique design. 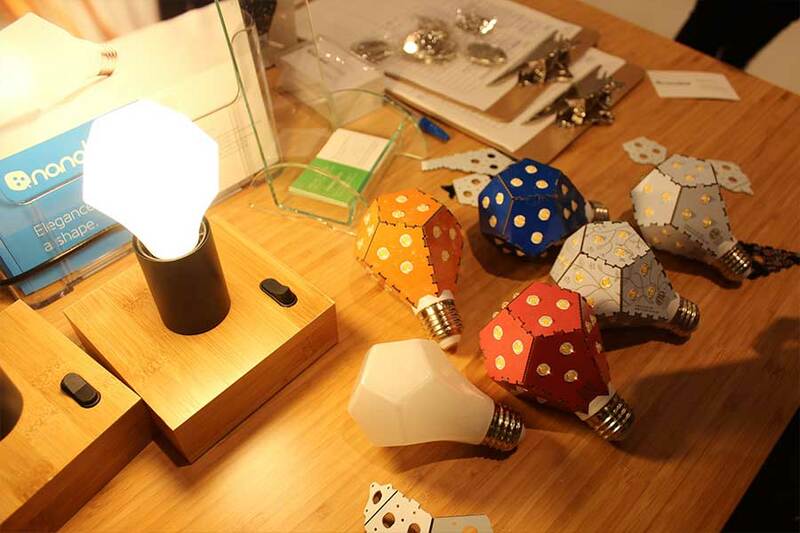 The newest addition to the company’s lineup of ultra energy-efficient bulbs, the artistic, tungsten-like light is as eco-friendly as it is elegant. 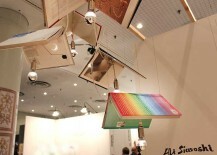 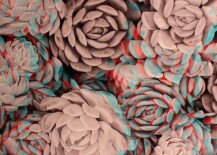 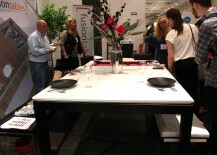 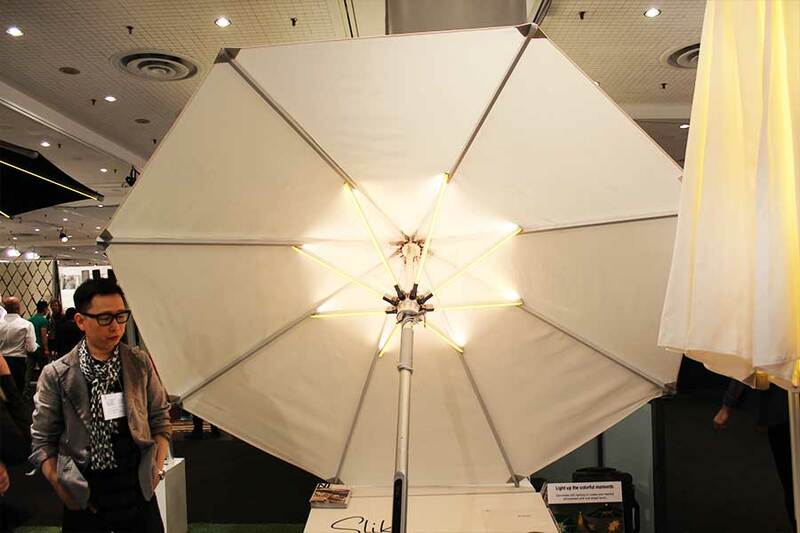 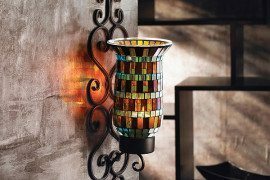 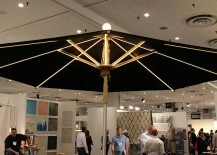 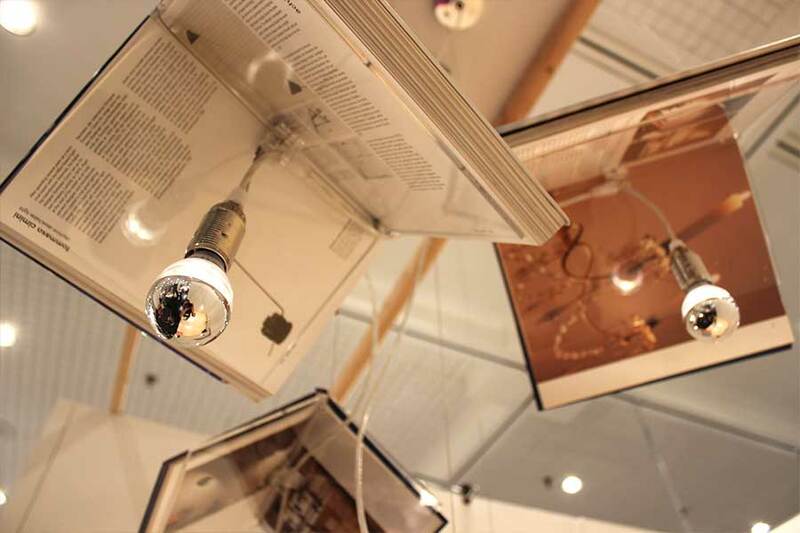 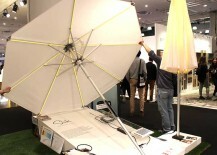 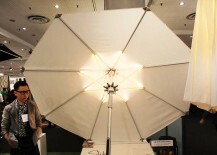 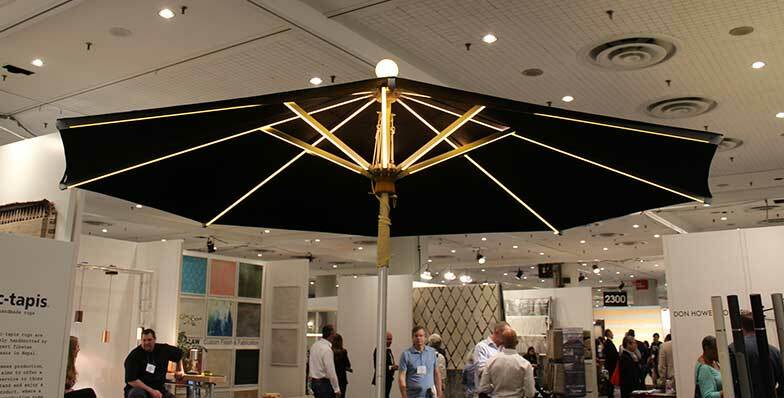 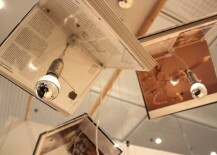 We hope our ICFF roundup gave you a few bright ideas for how to incorporate a little whimsy into your own home!